Once again we look forward to welcoming visitors to our sugarhouse for NH Maple Weekend. The “tours” we offer are in the sugarhouse and FREE! Brian goes over the maple production process from start to finish over and over all day long. So if you come in part way through just wait a bit and he’ll come back to the beginning. Questions are always welcome anytime. There are trees tapped close by to check out too both in the yard and down a short path. And be sure to check out the Maple Leafs with Maple Trivia questions to test your maple knowledge. PARKING: Crowds will be expected so please park only on the right hand side (our side) of Candia Road or on Sheepwash Road a short walk before you get to our place. No parking is allowed in front of our mailbox or on the hill beyond our driveway for safety reasons. FOOTWEAR: The driveway and parking area are dirt so with the snow they will be muddy/slushy. Proper footwear is encouraged. RESTROOMS: We do have a Porta-Potty located on site for your convenience next to the cordwood stacks behind the sugarhouse. Happy Spring! Waking up to the snow that was, wasn’t, and then was coming, apparently came to give us a reminder of how beautiful a blanket of snow can make things look. With 40 degrees predicted for this afternoon, it will be here only briefly so enjoy the frosting while it lasts. 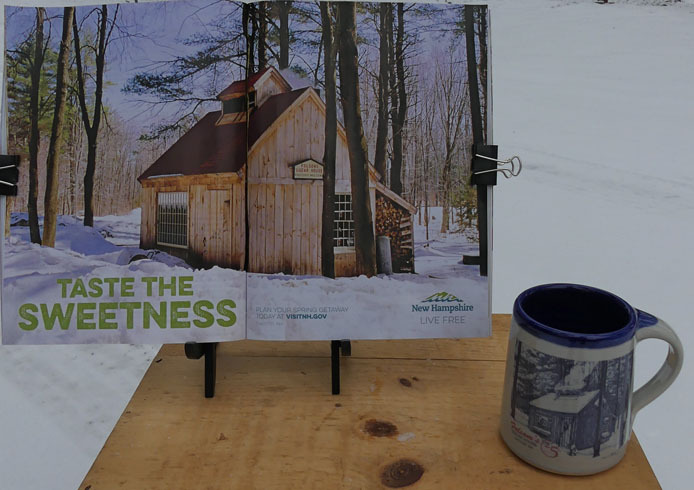 Our warmest thanks to all who came out over Maple Weekend to the sugarhouse. It seemed most all were happy with their visit and we are always happy to have such nice people here to learn about the maple process and products. We did decide to rent a portable restroom this year and will do so in the future for our customers comfort. And lastly we need to thank our family for all their help too. We could not have Maple Weekend without all of them. Three generations all pitching in. There’s Mom, sisters Andrea and Terry, son Tyler & girlfriend Kristy and daughter Megan. It means so much to have them with us. Once again we look forward to welcoming visitors to our sugarhouse for NH Maple Weekend. The “tours” we offer are in the sugarhouse and FREE! Brian goes over the maple production process from start to finish over and over all day long. So if you come in part way through just wait a bit and he’ll come back to the beginning. Questions are always welcome anytime. There are trees tapped close by to check out too both in the yard and down a short path. PARKING: Crowds can be expected so please try to park only on the right hand side of Candia Road or on Sheepwash Road a short walk before you get to our place. The driveway and parking area are dirt and can be muddy so proper footwear is encouraged. This morning we just listened to Channel 9 weatherman Josh Judge explain El Nino effects on our winter. Guess that explains this weird weather since November pretty closely. In honor of our 25th year for Folsom’s Sugar House we have had a limited edition mug made up with our pen and ink drawing that we’ll have on sale for a special price while they last. The pen and ink was done from a photograph of the original building Brian had taken the year we opened in 1991. The wood shed only lasted a couple years before we needed more space for visitors and Brian closed it in. Then in the late ’90s we needed to move the products to a bigger space and added on the current shop space. Seeing this picture, for us, is like seeing your kids baby pictures. Very nostalgic!